Harry Bryan (Representing the City of Hoschton) Serving since 2011, re-elected for a second term 2014. Harry has lived in the Braselton/Hoschton area for 30 years. He is married to Rena Bryan and has 2 daughters, Rebecca Crawford and Malia Bryan. He has a Bachelors Degree from Auburn University and is the owner of Grounds Management Group since 1996. His wife Rena taught school in Jackson County for 22 years and now teaches in Hall County. Harry began his involvement with the Fire District in 1986 as a volunteer firefighter and served in that capacity for around 5 years. He was later appointed to to the Fire Board in 1999 to serve out the term of an elected position. In January 2011, he was again appointed to fill a vacant position on the Board and has since been re-elected. This is the post he proudly serves in today. 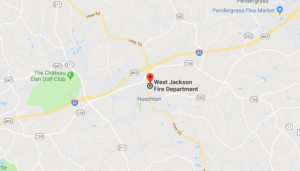 He asks that any questions or concerns regarding the District be directed to West Jackson Fire Department, Attn: Harry Bryan, or by emailing him at hbryan@wjfd.org. He will receive any messages and all will be contacted in a timely manner. Tony Harris (Representing the Town of Braselton) Serving his first term since January 2015. Tim Sweat, Chairman (Representing Unincorporated Hoschton) Serving since Appointed June 2007, re-elected 2008, 2012, and 2016. Sheri Brown (Represents Unincorporated Porter Voting Precinct) Serving since Appointed September 2013, reappointed January 2017. Robert “Bob” Bicknell (Represents Unincorporated Randolph Voting Precinct) Serving since Appointed February 2016, elected in 2016. I am 72 years old, a retired aviation engineer, with a lovely wife Jessie and 5 lovely daughters. Being born in Coventry England an industrial city at the end of World War II, I was indentured as an aviation engineer with Dunlop Aviation completing this and being a fully-fledged ‘Aviation Engineer.’ During this period of 16 thro. 21 to occupy my time with sporting activity, I took up competitive cycling and found I could beat most of my rivals successfully and ended up being a national champion representing my country ‘Great Britain ‘ in World Championships , commonwealth games, Olympics, and various Grands Prix all over the world. I still maintained my amateur status working for Dunlop Aviation, and progressed to being a team manager for Great Britain. Some time after completing my apprenticeship, I took up a position as a field support engineer, being promoted thereafter to a supervisor. In 1984 I was requested take up an assignment in the USA as a B757 service manager to oversee the certification of the company’s wheels & carbon brakes on the B757. In 1990, I was offered a position with Bendix wheels and brakes in Seattle, WA. This position was covering the certification of the B777, B767, B737 (next gen.) B2 as well as covering various airline and military bases as a wheel/brake specialist. During this period I took out American citizenship (1990) and currently hold valid US passport. I retired in 2004 after spending my entire working life in aviation. Currently I am president of Southampton falls HOA. This position follows my being president of Litchfield Country Club –POA in S.C.